Heat gas or charcoal grill. 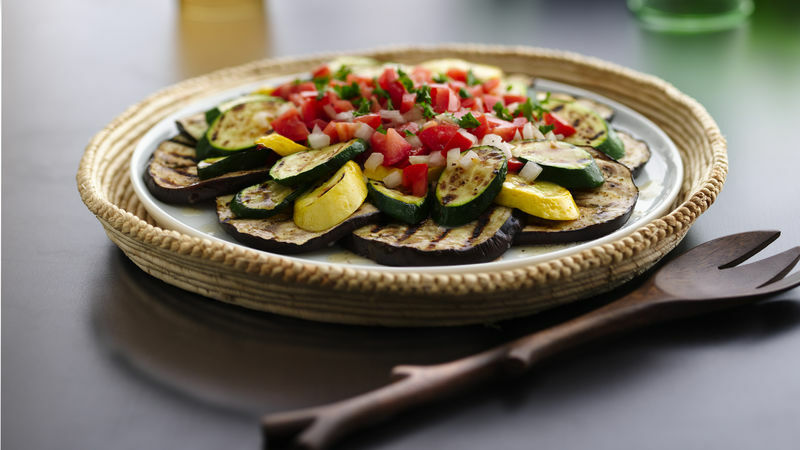 Brush eggplant, squash and zucchini slices with oil on both sides. Place on grill over medium heat. Cover grill; cook for 8 to 10 minutes or until tender. Remove vegetables from grill; brush on both sides with 2 tablespoons of the vinaigrette. Meanwhile, in a medium bowl, place tomato, onion, lemon juice and salt ; mix well. Stir in 2 tablespoons of the vinaigrette. Arrange vegetables on serving platter; drizzle remaining vinaigrette over vegetables. Top with tomato mixture. Add something tasty to your family’s Italian cuisine night. Serve these grilled vegetables and roasted garlic vinaigrette – a distinctive side dish.